This is another wallpaper design by A.W.N. Pugin in the museum collection. Pugin began designing wallpapers in the early 1840s, and was the most prolific wallpaper designer of the 19th century, designing more patterns than even William Morris. He created a number of private commissions for large country houses, as well as papers for more general use, but the majority of his designs were created for the Houses of Parliament, for which he created over one hundred different patterns. Pugin was one of the early proponents of the British Reform movement and he sought inspiration from authentic Gothic sources and rendered all his designs without perspective, as seen in this design. 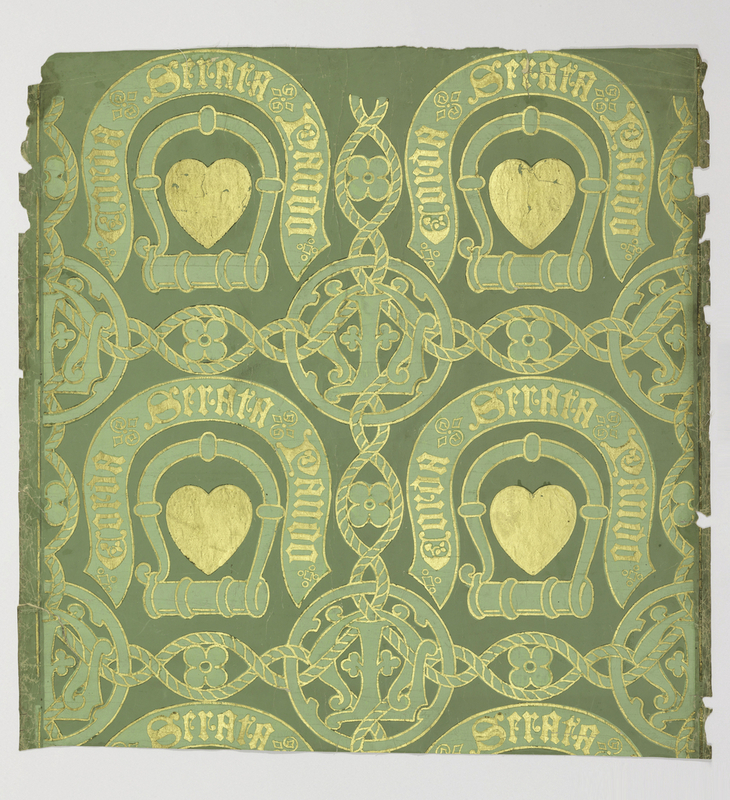 This wallpaper was one of Pugin’s private commissions, created for Lady Macdonald Lockhart to be installed at Lee Castle, Lanarkshire, Scotland. The design consists of a gold heart set within a fetterlock (a shackle or handcuff), under a horseshoe-shaped banner bearing the words: Corda Serata Pando (I open locked hearts). The heart within the fetterlock is found on the Lockhart family crest, shown below, which illustrates how Pugin personalized his private commissions. This motif is surrounded by twisted rope embellishments forming a grid pattern with a circular medallion bearing the initials L and M at each intersection. The original Lee Castle was built in the 13th century but the current structure is the result of renovations and additions carried out in the early 19th century, completed in 1845. So this wallpaper was designed to ornament the recently renovated and enlarged structure. Greg Herringshaw is the Assistant Curator for Wallcoverings.